Porsches continue to perform very well at collector car auctions with a 2016 Porsche 911 R selling for $539,000 at Bonhams The Zoute Sale in Belgium. As the first 911 R offered at public auction, this set a new world record for the model (that is still in production but all 991 cars were pre-sold). Another world record at auction was set by the ex-Derek Bell factory prototype 1987 Porsche 928 that sold for €253,000. The top result at the Bonhams The Zoute Sale 2016 was €586,500 for a 1955 Porsche 356 ‘Pre-A’ 1600 Speedster. Bonhams 4th annual sale at the exclusive Belgian seaside resort of Knokke Le-Zoute on 7 October 2016 became a homage to Porsche, a marque that saw values rise very fast in recent months for a variety of models. Two Porsche models and a Mercedes Benz achieved world-record prices in the packed saleroom, although the highest result of the auction was €586,500 for a 1955 Porsche 356 ‘Pre-A’ 1600 Speedster. Bonhams sold 28 of the 30 cars on offer. A highlight of Bonhams the Zoute Sale 2016 included the 2016 Porsche 911 R, regarded as the most sought-after modern Porsche today. Launched new six months ago at €200,000, all 991 produced were pre-sold, so when Bonhams offered the first model to come to auction, there was the expected bidding frenzy. Estimated at €250,000-350,000 (£210,000-300,000), no less than 11 telephone bidders fought against the room where it eventually hammered for €483,000 ($539,000). 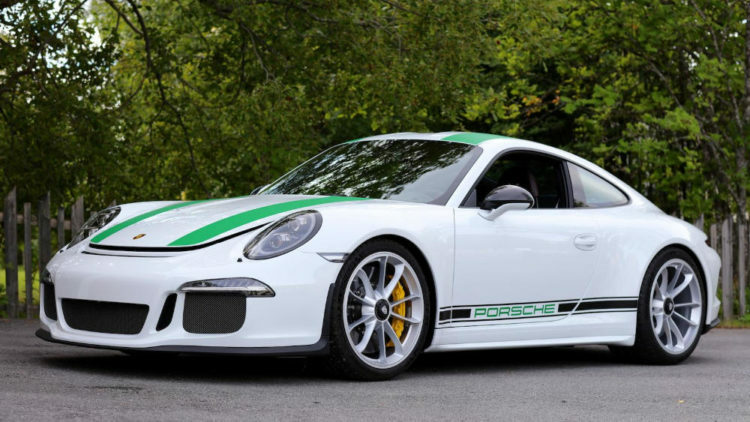 Although a Porsche 911 R was offered earlier in the year for $1.3 million on Ebay, this was the first car of this model sold at public auction. Although the 911 R is not the most-expensive 911 currently in production, it is limited to the 991 cars. The 2016 Porsche 911 R sold by Bonhams was the 135th produced. It was delivered new to Sweden and has covered only 52 km from new. Not a bad return on investment for the original owner. Another world record at auction was achieved when the ex-Derek Bell factory prototype 1987 Porsche 928 sold for €253,000 (£228,593). One of only five prototype Club Sports built for Porsche’s factory drivers, this model was first owned by five-time Le Mans winner, Derek Bell, and believed to be one of only three to have survived. And the records kept tumbling when a 1969 Mercedes Benz 280SL Pagoda 5-speed ZF gearbox sold for €230,000 (£207,811) – another Bonhams world record at auction for this highly popular model. In contrast, prices for the iconic 300 SL Gullwing and Roadster have been noticeably weaker during 2016 compared to prices achieved in 2015 and 2014. The top result at the Bonhams The Zoute Sale 2016 was €586,500 for a 1955 Porsche 356 ‘Pre-A’ 1600 Speedster, one of the very rarest Pre-A Speedsters. A multiple concours class-winner, it boasted matching numbers, matching colors and a very early 1600cc engine from new. First owned until 1958 by the well-known racing driver, Yves Tassin, who still lives in Knokke Le-Zoute, it was entered by its current owner last year in the Zoute Concours d’Élegance where it won the trophy for ‘Most Sensitive Restoration.’ After a lengthy bidding battle between a telephone bidder and a couple in the room, it achieved €586,500 (£529,920). No less than 60 Porsche 911s will be on offer amongst the 430 cars at the RM Sotheby’s Duemila Ruote sale in Milan in November 2016.